TALLAHASSEE, Fla. – In a secondary loaded with former five-star prospects and potential future first-round draft picks, it can be difficult for a freshman to stand out from the crowd. But Hamsah Nasirildeen is an emerging exception to that rule, a first-year safety who after only two weeks has emerged as one of the pleasant surprises of Florida State’s fall camp. He’s big (6-4, 210 pounds). He’s athletic (a former basketball standout, in fact). He can run, he can cover, and he can judge the ball in the air. Per Fisher, he’s got enough size to hang with bigger receivers and tight ends, and he’s got enough speed to shadow smaller, more elusive ball-carriers. It shows. While Nasirildeen is likely being groomed to become FSU’s safety of the future, he’s impressed coaches enough to be tried out at various positions in a secondary that holds versatility as one of its core values. 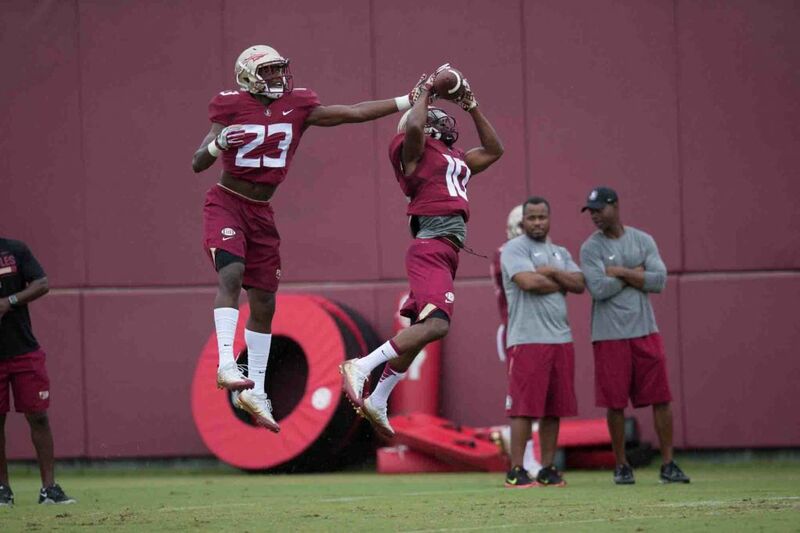 And history shows that FSU’s defensive coaches won’t be shy about playing a freshman, especially in the fifth and sixth (“star” and “money”) defensive back positions. Jalen Ramsey and Nate Andrews both excelled in those types of roles as freshmen in 2013, as did Derwin James in 2015. And if it feels a little early to compare Nasirildeen to someone like James, think again. “(He’s a) big, physical safety that reminds me, athletically, a lot of Derwin James,” defensive coordinator Charles Kelly said at FSU’s National Signing Day party in February. Fisher said that basketball was actually Nasirildeen’s first focus, and that his physical skills honed in that sport helped him enjoy a unique transition to football. At Concord High near Charlotte, N.C. – an alma mater Nasirildeen shares with FSU running backs coach Jay Graham – Nasirildeen played receiver, tight end, linebacker and safety. He didn’t even play on defense until his junior season, when he racked up 85 tackles, five interceptions and two forced fumbles. Over the next two years, Nasirildeen caught the attention of major college football programs across the country and earned an invite to the U.S. Army All-American Bowl in Texas. Thanks in large part to a relationship with Graham, Nasirildeen picked FSU over heavy interest from local powers Clemson and South Carolina. “He is a very smart young man who is eager to learn,” Kelly said. Despite wearing a blue, non-contact jersey over the last few practices (a measure Fisher described as precautionary), Nasirildeen has already developed a reputation for his driving, forceful collisions. Perhaps in a few weeks, he’ll be lowering his shoulder into an unfamiliar face. “He goes full speed and runs into everybody,” Fisher said with a smile.